Have you ever been in a situation where multiple people experience the same event, yet they all walk away with a different understanding of what just occurred? People see and experience the world differently. The Perceptual Style Assessment (PSA) is the tool that will allow you to understand the way you perceive the world and what makes you unique! The most successful and happy people in the world are the ones who RECOGNIZE and CLAIM their natural strengths. USE them in their personal and business lives, and VALUE the talent differences between themselves and others. Once you've experienced the power of our Perceptual Style Assessment you may want to take advantage of one of our other programs, intended to help you "Do more of what you do best" and in the process improve your life and career. Even if you chose to not use one of our other valuable programs, you will see that for the cost of a few cups of coffee, you will gain a new understanding of the way you perceive life and the world around you and how this perception can help you improve yourself. The Owner's Manual series teaches you how to unleash your deepest potentials for success in all aspects of your life. You wouldn't purchase a major appliance, a new car, or a new smart phone without an Owner's Manual. Why try to navigate your life without one? Select this link to learn more about Your Personal Owner’s Manual. Select the appropriate link below for additional information. 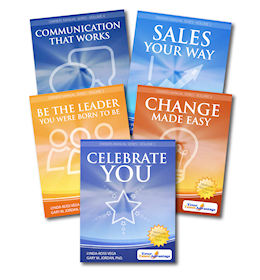 The first volume of your Owner’s Manual (Celebrate You) provides you with an in-depth assessment specifically designed to identify how you see and experience the world and what your natural strengths are. Unlike other assessments that measure social behavior or personality traits, our Perceptual Style assessment identifies the skills and strengths that are innately yours in all aspects of your life! Select this link for additional information. Please click the image on the left to see a sample of the information provided. The second volume of your Owner’s Manual (Be the Leader You Were Born To Be) Whether you are a solopreneur, manage people within an organization, own the corner café, or direct an Internet marketing empire, you’re a leader. Your success in every facet of your business life relies on how effective you are in this role. Select this link for additional information on how PST can help you be a successful leader. Please click the image on the left to see a sample of the information provided. Each program in the Success Road Maps series provides you with the tools you need to create success in your life with special focus on specific areas such as your career or business, your team, your partnership relationships, and your family. Use one Success Road Map or several - focus on what is most important to you! Select this link for additional information. If you are searching for the answers to questions such as "How can I put my strengths to use in my life right now?" or "Why am I so exhausted at the end of the day?" or "I need to make a change, but what will be the right change?" then this is the program for you! Select this link for additional information. Please click the image on the left to see a sample of the information provided. The Entrepreneur Success Map combines the Recognized Strengths Profile and 3 one-on-one coaching sessions with a master Your Talent Advantage coach to match your natural skills to your business, identify exactly what skills you need others to perform for you, and a customized plan for selecting and managing the right people to support you. Select this link for additional information. Please click the image on the left to see a sample of the information provided. Are you and your business partner achieving the success you dreamed of? Do you have all the tools to make your partnership thrive? The success of any partnership depends on the ability of the partners to appreciate each other’s strengths, know the challenges they will face together, and to have in place mitigation strategies that will ensure effective partnering in all aspects of the business partnership. Select this link for additional information. Please click the image on the left to see a sample of the information provided. Gone are the days of starting your working career right out of school and staying with the same company until you retire. Over 75% of people will have more than 3 jobs during their career. Over 50% will have 4 or more! Planning your career - knowing what criteria make a job an excellent fit for you and what to stay away from - is critical in today's job market. Select this link for additional information. Please click the image on the left to see a sample of the information provided. If you are a manager, team leader, or entrepreneur you know that an effective team is critical to your success. Matching team members to the right tasks, minimizing miscommunications, motivating each team member, creating value and buy-in, and achieving great results are the keys to effective teams. Select this link for additional information. Please click the image on the left to see a sample of the information provided. One key to unraveling some of the complexity of the family roles we all experience is Perceptual Style. The reality is that families are made up of individuals with different Perceptual Styles and that difference creates challenges. Rather than placing blame, looking for who is right and who is wrong, or offering simplistic techniques, the Family Dynamics Success Map offers a way to understand the real differences between how family members see and experience the world around them. Select this link for additional information. If you are considering a partnership, already in a partnership that you are ready to take to the next level or suffering through a tough time in a current partnership, we've got the program to help you! At Your Talent Advantage we believe in partnerships. Not just in theory, but in practice. We are a partnership (in fact we are a combination of business and personal partnerships) and we apply all of our own tools to ourselves. Select this link for additional information. The success of any partnership depends on the ability of the partners to appreciate each other’s strengths, know the challenges they will face together, and to have in place mitigation strategies that will ensure effective partnering in all aspects of the business partnership. Through the Partnership Success Map program, you will gain the insights, tips and techniques that will strengthen your partnership and help you to achieve the results you have dreamed of! Select this link for additional information. Please click the image on the left to see a sample of the information provided. Success as an entrepreneur is built from the inside out. The more you know about yourself, what you do naturally well, how you prefer to take action, what roles you are destined to excel in, the easier it is to select the wheat from the chafe among the hundreds of options that bombard you. Select this link for additional information. No more trial and error, take control of your destiny as an entrepreneur! 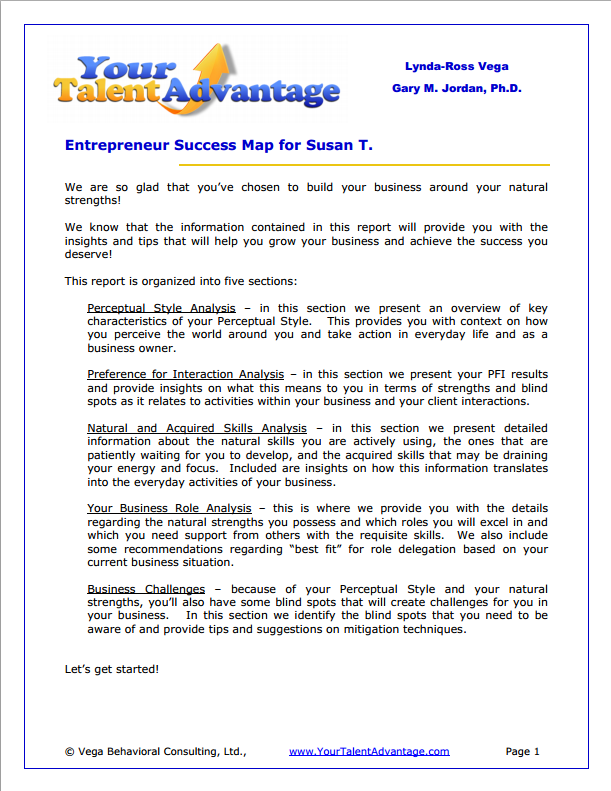 The Entrepreneur Success Map program was developed just for YOU - so that your unique brilliance will shine in your business. You are too important, and your business is too important, for you to settle for anything less than a truly customized map for your success. Select this link for additional information. Please click the image on the left to see a sample of the information provided. An effective team is critical to your success. Matching team members to the right tasks, minimizing miscommunications, motivating each team member, creating value and buy-in, and achieving great results are the keys to effective teams. The Effective Team Success Map is your answer if you have an existing team and you are ready to lead them to unprecedented success. Select this link for additional information. Please click the image on the left to see a sample of the information provided. Coaching is all about results. Whether you are a life coach, a business coach, a career coach, a health coach, a sports coach – whatever your coaching specialty – your coaching practice will fail if your clients don’t achieve real, lasting results The best way to understand your client, their strengths, their limitations, how they see and take action in the world, is to use a scientifically proven, reliable and accurate assessment. You guessed it – the Perceptual Style Assessment is what you need! Select this link for additional information. Here’s where you’ll learn all about the ways that different Perceptual Styles play off each other, what motivates them, and where they naturally fit in the world. These are the kind of deep insights—delivered in a clear, practical format—that will allow you to speak your client’s language and, just as importantly, understand what they really saying. Learn the secrets of how to make yourself understood in terms that are compelling to your clients regardless of how different they may be from you. You’ll make the connection between your own natural communication strengths and those of your clients in order to connect deeply and profoundly, every time. Select this link for additional information. Please click the image on the left to see a sample of the information provided. Are you one of the select coaches who wants to master the theory that is the foundation for the Your Talent Advantage assessments, Owner's Manual Series, and Road Maps? Are you fascinated with the psychology behind the theory? Do you want to harness the full power of Perceptual Style Theory for your own programs? Then this Certification program is for you. Select this link for additional information. Please click the image on the left to see a sample of the information provided.